Jojoba oil is produced from seeds of a plant called “Simmondsia Chinensis” also referred as Jojoba plant. It is a shrub which grows in Southern California, Arizona, and northwestern Mexico. Hair conditioner is a viscous liquid which changes the texture and color of hair. And the essential fatty acids of jojoba oil make it a good hair conditioner. It is very effective for the dry skin. It improves the texture and color of the hair. Many doctors prescribe it for dandruff. It also adds shine long with making your hair more soft and flexible. Excessive production of sebum is also not good for hair. Jojoba oil regulates the production of sebum and maintains the quantity of oil in our hair. If you have curly hair then adding some drops of Jojoba oil makes combing easier. It will unclog hair follicles and prevent hair loss. Because of its molecular structure, it is identical to sebum (waxy material produced by glands that lubricate the hair), it doesn’t cause any harm or side effects to the scalp. It also has antibacterial and anti-fungal properties that is a reason it is also found useful to treat dandruff. It consists of monounsaturated fats, which allow it to penetrate hair follicles and strengthen hair fibers. Jojoba oil adds shine and elasticity to the hair. Recent studies have shown that massage of jojoba oil on the scalp also increases blood supply to the scalp which encourages hair growth. Everyday hair follicles and fibers are damaged due to certain environmental factors. Its regular use repair damaged hair fibers. It adds some volume to the hair and makes them thicker. 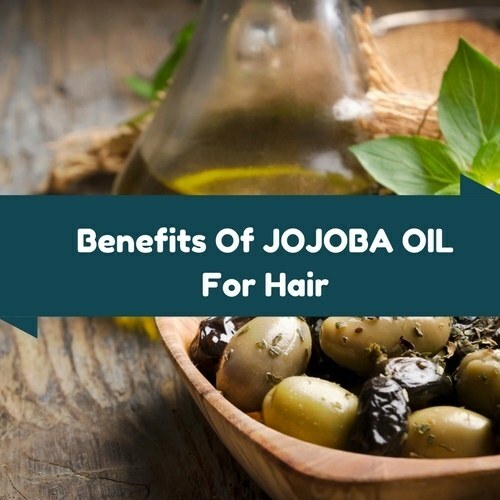 Above benefits suggest that jojoba oil can be beneficial for hair growth. If you have tried jojoba oil for hair growth or anything else you can share here.